LED treatments work by using an array of bright light-emitting diodes (originally developed by NASA!) that send low-level light energy into the deeper layers of the skin. Red light LED stimulates cellular activity, including the fibroblasts that produce collagen, which gives young skin its plump look. That helps minimize fine lines and wrinkles, treat sun-damage and stretch marks, and reduce redness after more aggressive IPL or laser treatments. The results won’t be as dramatic as plastic surgery, IPL, or laser, but it’s a gentler, more natural, less expensive way to go. Both are highly effective when part of a series—usually six treatments one to two weeks apart, followed by a maintenance treatment every month or two. 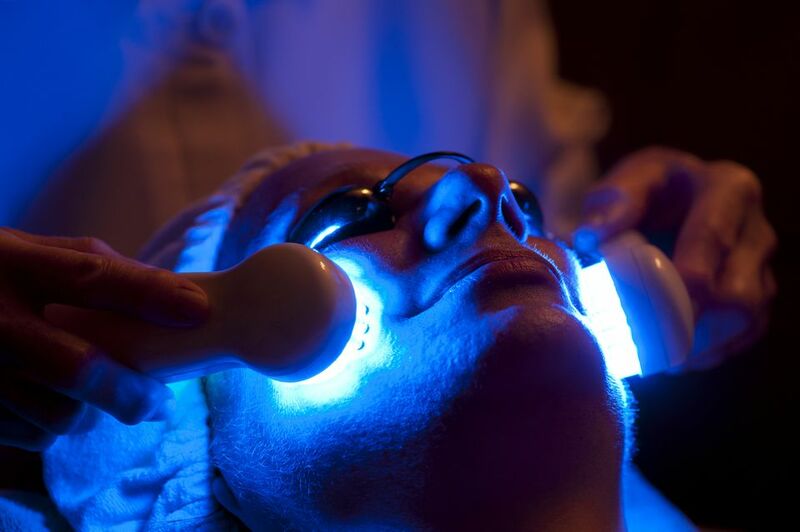 LED treatments last about ten to twenty minutes, and can be a stand-alone treatment or part of a facial. They are given by an esthetician and usually cost somewhere between $75 to $125 a treatment as a standalone, more if part of a larger treatment such as a hydrafacial. LED light therapy treatments are sometimes also called simply LED, or by the name of the manufacturer, such as Dermawave or Revitalight. Professional LED treatments are given at select day spas, usually those with a serious focus on skin care, or from estheticians with their own skin care studios. LED light therapy treatments are also being found more frequently now at resort spas, which are emphasizing more results-oriented skin care treatments. Depending on the type of LED machine the spa has, it can take anywhere from five minutes to thirty minutes. Some machines have a small head (about three inches wide) that has to be held in place on the skin for a few minutes before moving on to the next spot. These treatments take longer. Other machines have a seven-inch square that the therapist holds over your face in three sections, so the treatment is done much faster. Your eyes can't be hurt by LED light so they don't have to be covered. LED light therapy treatments are a good choice for people who want to boost collagen or treat mild to moderate acne. Unlike IPL or laser treatments, LED treatments carry no risk of burning. An IPL treatment delivers a bright blast of light at very high energy levels through a hand-held device and can be uncomfortable, even painful. LED treatments are actually very soothing. However, if you want to treat brown spots, broken capillaries, spider veins, and diffused facial redness, you are better off getting an IPL treatment. Both LED and IPL work best in conjunction with a regular skin care routine that you develop with your esthetician.